The history of the Lagotto in the UK is also the history of the Lagotto’s spread outside Italy, and it really began in1990 at the Florence International Show. I was at the show and came across the Romagnolo and their little curly duck – come truffle – dogs trying (unsuccessfully) to get Italian show folk interested in their Lagots. I was immediately smitten and became part of the struggle to get the Lagotto recognised; knowing that I would have to wait until they were hopefully one day granted FCI interim recognition before importing them into the UK. 18 months later ENCI opened registration with the formation of a Breed Register, followed by admittance to the Italian show ring in 1992. FCI Interim recognition followed in October 1995, and at last the way was opened to import Lagotto into the UK. 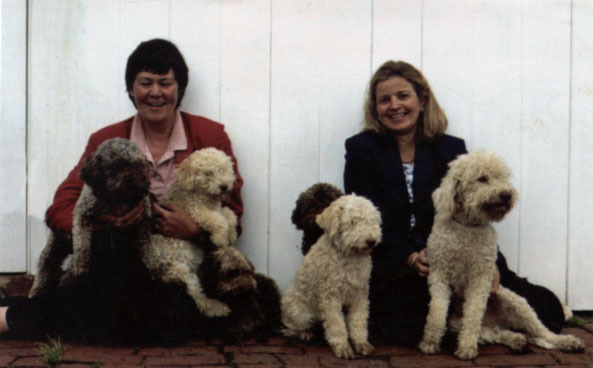 Fortunately by then Ann Kemp, one of my Spinone owners, had become equally smitten and together in the Spring of 1996 we bought Reno and Rossetta and founded the Lagotto Romagnolo Club of Great Britain – the club which pioneered the Lagotto not only in the UK but worldwide. … Together Ann and I imported six more foundation Lagotto in the next three years, all with names beginning with R for Romagna, and in 2006 the last two of the pioneer R imports, Ruffio and Rocco. The one early import not an R was my own import Flay in whose 1997 litter were born the first two show champions bred in the UK Ir Ch Gaesten S’Alfredo del Grancanna and Aust Gr Ch Gaesten Sarollo who went down under to be the founding sire of the breed in Australia. Here is a copy of the Founder Member badge, which you may have seen worn with pride by some of our Founder Members at events…. 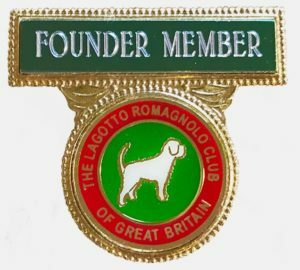 © 2018 The Lagotto Romagnolo Club of Great Britain. All Rights Reserved.